Summary : The Mr. Beams LED lantern is a compact, battery powered lantern with a pretty awesome USB port for charging devices. There are plenty of LED lanterns out there, so to stay out you better be unique. The Mr. Beams LED Lantern is just that. Compact, stylish and equipped with a USB port to charge your USB powered devices. We have been using it lately on our camping excursions and have been impressed. Appearance: The Mr. Beams lantern is a sleek and compact lantern with some great grips on the sides to easily hold on to the lantern. The lantern will give off a 360 degree light which helps to light up a lot of your campsite. 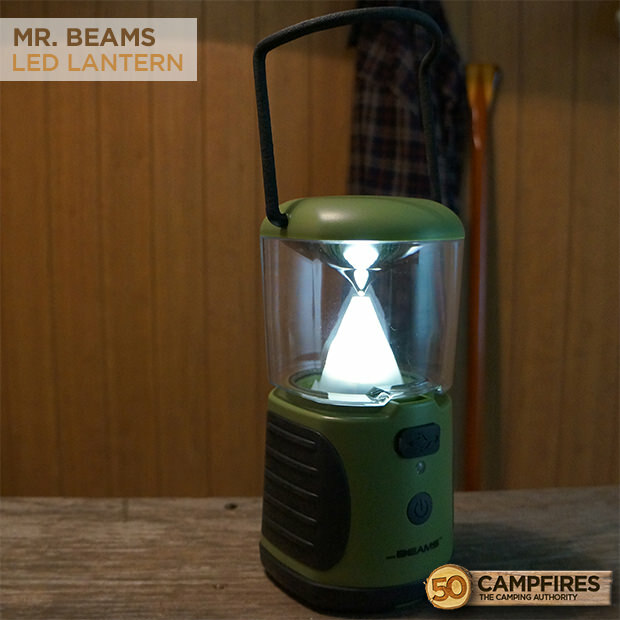 Coming in both a white and green color the Mr. Beams lantern has a pretty small LED cone inside the lantern. With 2 settings the lantern can be bright or low and is easily carried with the rubber feeling handle. Or you can flip it over, open the latch and you have a little hook to hang the lantern upside down. The front of the lantern you’ll see a plug that opens to reveal the USB port. Ease Of Use: This lantern is very simple to use. The ON/OFF switch gives you both light settings. Pushing the button once gives you the bright setting giving out 260 lumens of light. Push it again and you have the low setting that puts out about 20 lumens of light. Both hanging options are simple to use and figure out. The Mr. Beams LED lantern runs off of 4 D Cell batteries, that are very easy to install. If you are a forgetful person, like us, the lantern has an auto shut off after an hour of inactivity. Durability: The lantern was meant to handle the weather. Being weather resistant the Mr. Beams LED lantern can handle a multitude of weather conditions, including rain. We wouldn’t recommend dropping it, as it is not rated to take that kind of beating. But just feeling this lantern you know it is made well with quality and durability in mind. 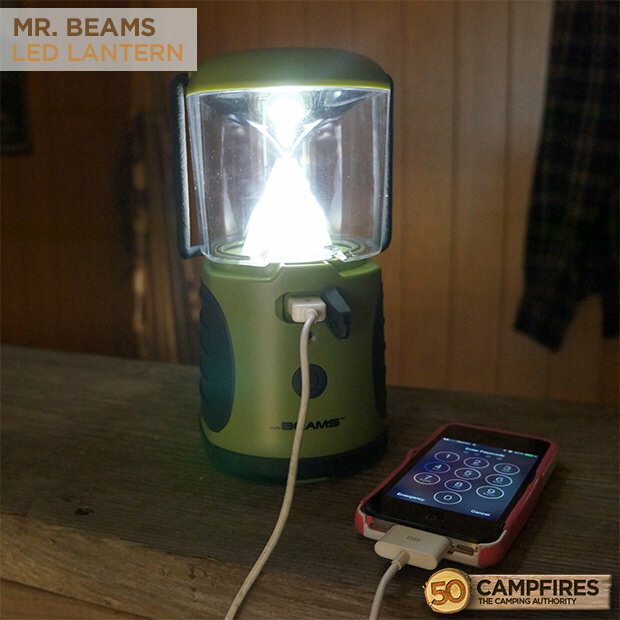 Value: For $39.99 the Mr. Beams LED lantern is a great value as it gives you light and the ability to charge your USB devices. On one set of batteries you will get 30 hours of light, if you want to charge your phone 3 times you’ll still get 15 hours of light. 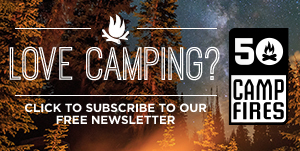 We would highly recommend checking this little lantern out for your next camping trip. Weight: Weighing in at just 2.5 pounds with batteries, the lantern is a very light weight lantern to bring to the campsite. 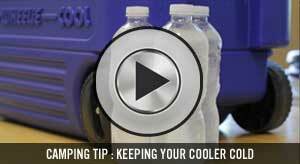 With its compact size it will also pack well in your camp box or luggage.